BlueM.Opt v1.6 has been released! The main change is the complete translation of the interface to English. Also, most of the documentation in the BlueM wiki has been translated to English. Furthermore, Talsim-NG has been added as a new simulation engine. Added support for the simulation engine Talsim-NG (© SYDRO Consult GmbH). Talsim-NG engine v3.0.1.6 is included. Translated the main GUI and all messages related to PES (Parametric Evolution Strategy), SensiPlot (Sensitivity Analysis) and Talsim-NG to English. 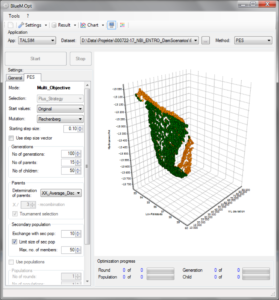 When displaying the decision space as a scatterplot matrix and not selecting all optimization parameters for display, any selected solutions were being displayed incorrectly. Dropped support for the objective function “IHA-Analysis”, IHA-Software no longer included.